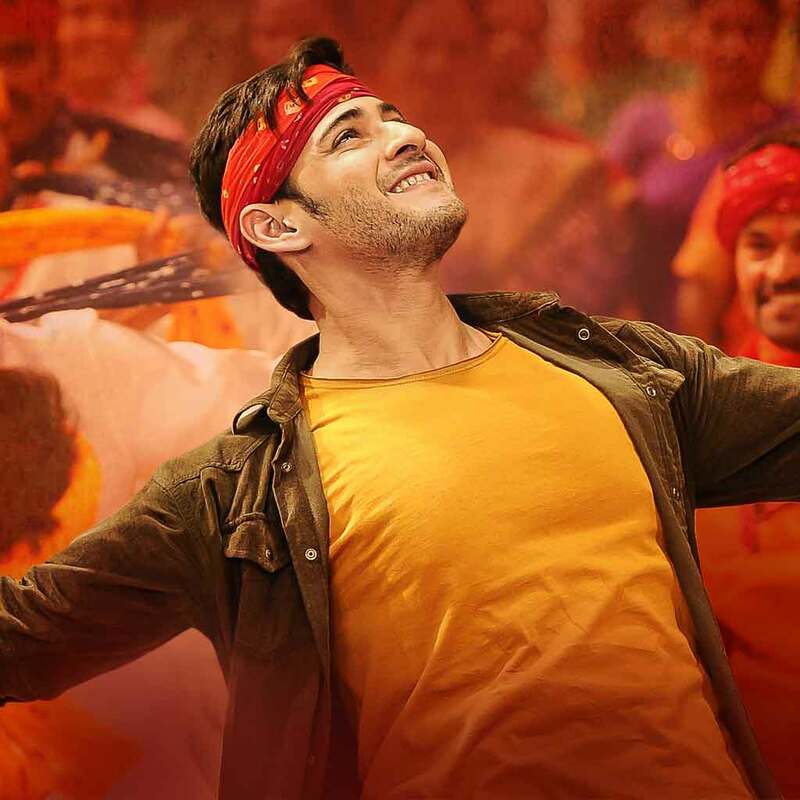 Mahesh Babu’s latest is a commercial masala movie that manages to fit in some better than expected moments while still remaining true to its mass roots. Writer/director Koratala Siva has penned a good story and although the film could have done with some snappier editing and less one-sided fight scenes, overall Srimanthudu is an entertaining watch. Along with Mahesh Babu and Shruti Haasan, the film features a cast of thousands with almost every Telugu actor appearing at least briefly on-screen, but for a wonder there is only Ali as the mandatory comedy uncle and even he has a very truncated role. 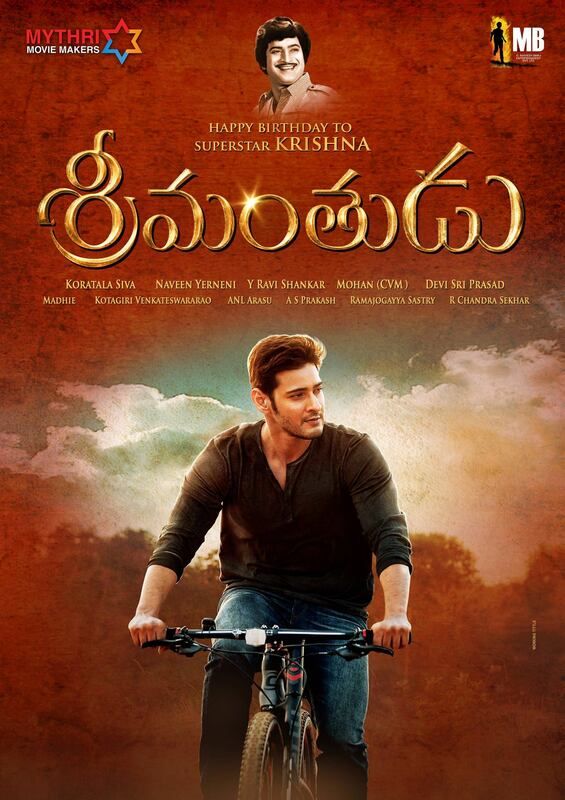 That alone makes it a step above the usual fare, and with Mahesh at his charismatic best and some great songs, Srimanthudu is well worth a trip to the cinema. Mahesh plays Harsha, son of a millionaire businessman and the heir to both the company and his father’s fortune. However that’s not what Harsha wants and he refuses to conform and take over the business despite his father’s continual gentle pressure. 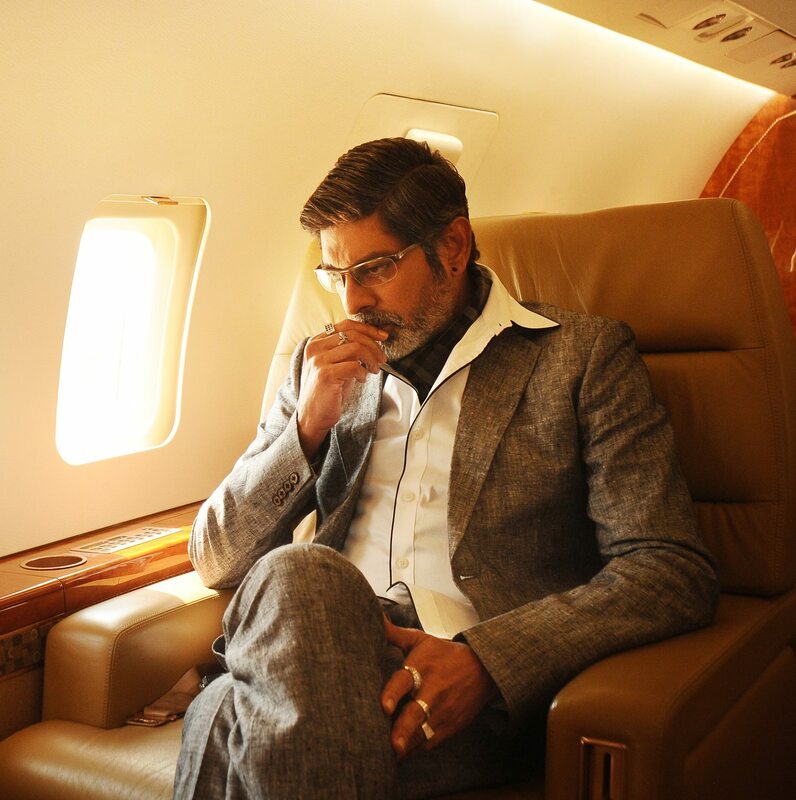 The scenes between Harsha and his father Ravikanth (Jagapathi Babu) are a little clunky, but the sentiment hits at the right level with Harsha treating his father with respect despite disagreeing with him on almost every topic. Although Ravikanth is very much a family man, he is cold and distant with no interest in anything outside his millions, while Harsha is diametrically opposite, more interested in his father’s employees and their ambitions. Harsha isn’t totally adverse to those millions though and they do come in handy whenever he needs some cash for his various schemes. When driving his mother (Sukanya) and sister to the temple one morning, Harsha sees Charu (Shruti Haasan) outside her hostel and drives round the block a few times to get a better look. Luckily for Harsha, Charu also turns out to be cousin to his friend Apparao (Vennela Kishore) and she turns up at his birthday party. She’s beautiful and quirky but her biggest draw for Harsha is that she’s studying rural development at college – something that sounds just his cup of tea. Naturally Harsha enrolls in the same course and while Charu is initially rather disheartened to discover that Harsha is really there to study and not just stalking her, romance does blossom between the two. As Harsha is falling in love and discovering his true calling, the film jumps to a small rural village where a school has collapsed and Narayana (Rajendra Prasad) is running around with a permanent expression of dismay as tragedy after tragedy occurs. Head villain Sasi (Sampath Raj) and his team of muscle men are slowly sucking the life from the village as their beer factory uses up all the water, and Narayana is doing his best to halt the decline as families leave the village and farmers commit suicide. Sasi is also in league with his brother, Minister Venkat Rathnam (Mukesh Rishi), whose son Radha (Harish Uthaman) is threatening Harsha’s father, so it’s inevitable that Harsha will get involved and use his new knowledge of rural development to save the day. Along with his excellent skills in dishoom of course! Multi-layer Mahesh has shed his multi layers for Srimanthudu and he mainly appears in a single shirt or elbow baring T-shirt, although the biggest cheers went to his appearance in a knee-baring lungi. He is a one-man unstoppable army and the fight scenes are more comical than exciting as Harsha dispatches any and all comers with ease. There is one fight scene at a wedding function which is cleverly choreographed, but the rest are a montage of villains hitting the ground and bouncing wildly in all directions while Harsha has no difficulty lifting men twice his size over his head and flinging them into the dirt. No one manages to even lay a finger on him until it becomes necessary for the plot, and even then it’s during a shady ambush where Harsha still comes out on top. It’s mayhem, but it’s Mahesh mayhem and I loved every minute! Shruti Haasan has a role with some substance and she’s generally good as Charu, even managing to hold her own against the star power of Mahesh. It’s good to have a heroine who doesn’t fade into obscurity as soon as the action ramps up, and Charu’s character does have enough depth to move beyond the romance track. The love story itself is well blended into the village make-over story line, while Mahesh and Shruti have good chemistry together adding a touch of plausibility. Shruti also has some lovely outfits, although she does fall foul of the costume designers in the Charuseela song. Seriously, no explanation is possible for the studded shoes, while the female choreography just adds insult to injury. The other songs are all much better with Poorna appearing in the first Rama Rama song, while Shruti gets to strut her stuff in the rest. The music by Sri Devi Prasad is catchy and the choreography generally very good – I loved a brief flash-mob style interlude in the bangle market during one of the songs while Dhimmathirigae bursts onto the screen in a riot of colour and is just as awesome as this teaser suggests. The accomplished support cast is excellent although with so many good actors quite a few seem underused. I would have liked to see more of Subbaraju, who briefly appears as one of Harsha’s relatives with a spiritual disposition, while Rahul Ravindran has a potentially interesting role as a rival for Harsha that sadly isn’t expanded any further. However Jagapathi Babu and Rajendra Prasad have better developed characters that allow shades of grey while Mukesh Rishi and Sampath Raj are just as black and despicable as such villains need to be. Srimanthudu may not be a perfect film, but it is a welcome return to form for Mahesh and infinitely better than last year’s Aagadu. 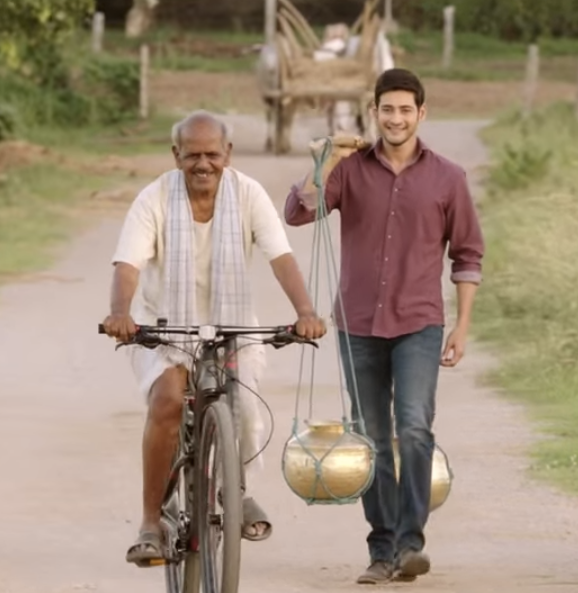 The film is a tad overlong and somewhat slow to get going in the second half, but at least Koratala Siva avoids any suggestion of appearing preachy by keeping the attention focused on Mahesh rather than the development work he is doing in the village. Nothing to complain about there! 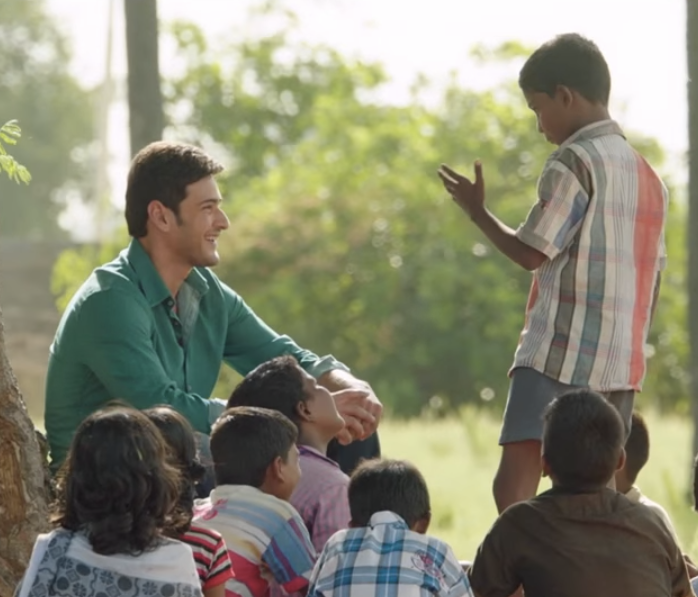 Mahesh is excellent throughout and with a story different enough to maintain interest and great performances all round, Srimanthudu is one of the better films I’ve seen this year. Recommended for Mahesh, Shruti Haasan and those crazy fight scenes.